You may have heard the Scottish expression Golf is not about life and death – it is much more serious than that. If you are serious about your game, you need to use equipment adapted to you. You are not like everybody else, nor is your golf swing like that of everybody else. It is a common misunderstanding that only elite players need clubs adapted to them. 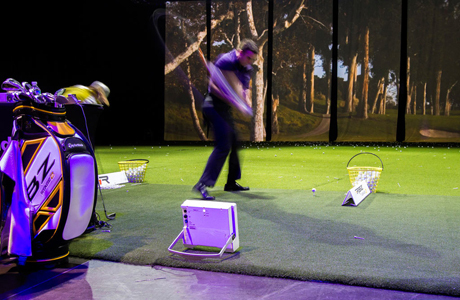 However, in fact the elite players are much better at adapting to the equipment than players with a higher handicap. Most club players need all the help they can get from good equipment, and our experience shows that there may be a great difference between the equipment the customer brings and the equipment which would really suit the customer best. Naturally, the custom fitting of equipment takes place outdoors where we, using our Doppler-radar (Flightscope) can measure the complete length of the shot. It is not possible to do so indoors, becausae it is necessary that the radar can follow the flight of the ball. We measure the speed by which the club hits the ball, the speed by which the ball leaves the club head, the spin of the ball, the initial angle, the height, length and much more. The analysis of all these data enables us effectively to find the equipment which suits the customer best. We are confident that the custom fitting, together with our price guarantee imply that our customers get the best offer on the market from us!